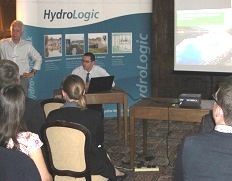 In October each year the Aquator User group meeting is hosted by Oxford Scientific Software and Hydro-Logic Services. All registered users and any other interested parties are invited to attend. Users are encouraged to make a short presentation on their work so that the user community can learn from others' experiences. This is also an important forum for the Aquator team to inform users about new developments and get feedback on issues encountered by users.